I want to thank Marc for inviting me to do this, and giving me the opportunity to spread the world of Michaela’s story. I pray that it would reach where it needs to reach … and while it is Michaela herself that I want most to reach, I have no idea of where else it might need to go. If I am never able to find my daughter, if I am able to help another person travel the road of grief and loss and come out whole, that is a gift to me, because it means Michaela’s suffering was not for nothing. Since this is the Klaas Kids newsletter, I just want to say that there are a lot of nonprofit organizations out there to serve missing kids, and quite honestly some of them seem to take in millions of dollars while doing not much more than sitting at their desks. From what I have been able to observe, Marc Klaas is not afraid to leave his desk and get his hands dirty. I have seen him tirelessly helping families of the missing, setting up searches. 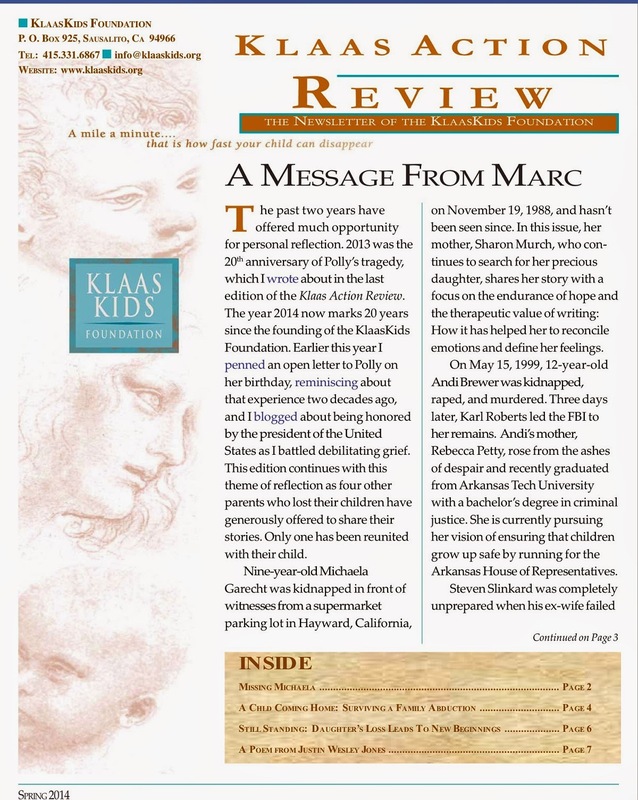 I attended the 20th anniversary of Polly’s kidnapping a little while ago and was able to see the search teams that Klaas Kids is setting up to work around the country. And you know, Marc doesn’t have to do this. He did not get trapped on the endless treadmill of searching for a child who could not be found; yet he stayed to help those who are. There is an article on CNN.comToday called “the deadliest trip” about a woman who works to find immigrants who have dissapeared that they think have become involved in human trafficking. Don't know if she could help, but she seems to want to make it her mission that's its more about finding people than the money or resources. So check the article. Couldn't hurt. Have a good day sharon.